Dr. Rakesh Nanda says he achieves an increase of 8-10% in permanent fat destruction by adding a Z Wave treatment after CoolSculpting. He estimates that with CoolSculpting alone, fat in treated areas can be reduced by 20-25%, but when Z Wave is added post Cryolipolysis, those results are bumped up 8-10%, reducing fat by 28-35%! Dr. Nanda is the Medical Director and CEO of 3 Grandview Aesthetic and Plastic Surgery Center and Jiva Med Spa and Plastic Surgery practice locations. In addition to the benefit of improved results after CoolSculpting, Dr. Nanda lists other advantages of treatments with the Z Wave device. He says that the uncomfortable post CoolSculpting manual massage is “completely eliminated with the Z Wave”. Z Wave treatments replace manual massage and use Radial Pulse Technology. Dr. Nanda explains that this technology speeds up the body’s metabolism, increases lymphatic drainage and blood circulation. The doctor continues to praise Z Wave treatments for requiring no down time, no incisions, causing no pain and for their affordability. In order to provide the best results for their patients, Grandview and Jiva offices offer the Zimmer Z Wave treatment without additional charge as part of their CoolSculpting and truSculpt® packages. (CoolSculpt and truSculpt devices use opposite methods to eliminate body fat. CoolSculpt freezes fat cells, whereas truSculpt uses radio frequency energy to heat fat cells. Both methods destroy, shrink and cause natural elimination of fat cells from the body.) The practice offers cosmetic surgery options, like liposuction, as well as several non-surgical alternatives to invasive body contouring procedures. Z Wave is also FDA cleared to reduce the appearance of cellulite. Dr. Nanda says that he and the staff are excited to be among the first in the area to offer Z Wave treatments to patients. The practice website provides additional information about their Z Wave treatments for cellulite and for enhanced body contouring results. Dr. Rakesh Nanda and Vicky Smith were not compensated for this video or for comments about Z Wave. Scroll to bottom to view the Z Wave video by Dr. Rakesh Nanda. 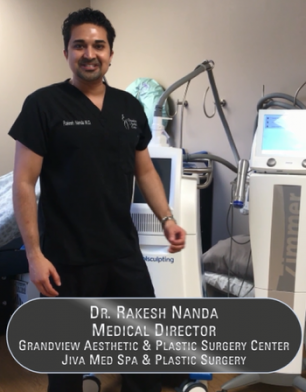 Dr. Rakesh Nanda is the Medical Director and CEO of Grandview Aesthetic & Plastic Surgery Center and Jiva Med Spa. He has advanced training in dermatology and dermatological procedures from George Washington University Medical Center and St. Luke’s Hospital and Health Network. He received specialized training and is fully certified and credentialed in advanced laser treatment of hair reduction/electrolysis, facial veins, facial resurfacing, tattoo removal, acne and rosacea treatment and varicose veins. He also holds certificates in cellulite treatment and advanced laser liposuction. Dr. Fernando Colon, based at the Grandview location, is a highly experienced and sought-after board certified plastic surgeon. He performs facial and reconstructive plastic surgery procedures like eyelid surgery and face lifts. The practice has three locations serving the Ohio area. Grandview Aesthetic has offices in Mansfield and Columbus, Ohio. Jiva Med Spa and Plastic Surgery is in Beavercreek / Dayton. Information can be obtained for all three Ohio locations by visiting www.greatskinohio.com.